Well, we’ve never had a Spring like it! (Nor autumn or winter)! 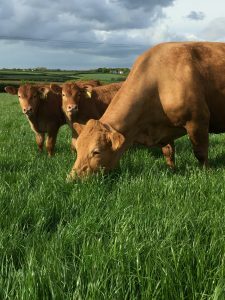 It has seemed a very long, wet winter this year as autumn 2017 was so wet and the cattle came into their winter quarters early. The wet time in 2017 had a knock-on effect throughout the winter period with feed stuffs and bedding being in short supply PLUS expensive. Our Spring barley crop, planted in Spring 2017 failed as it was too wet for the combine harvester to get onto the land. This meant we didn’t have our home-grown barley to feed our cattle nor did we have the barley straw from the crop to use as bedding for the cattle. We did manage to salvage the crop by mowing it and putting it into round bales which we sold a ‘whole-crop’ silage (as it is the whole of the plant), but took a dramatic loss on input. This meant we had to go out and buy our cattle feed and straw instead of using our own. As the weather affected the majority of the country it meant everyone was in the same boat and straw was in short supply. We managed to get enough to see us through but at nearly double the cost of the previous years price. Because this Spring has been such a long wet, late Spring, farmers in the area have been running out of feed for their cattle. Most of the cattle have ‘gone out to field’ approximately 2-3 weeks later than previous years. We have been selling round bale silage to friends and neighbours and for the first time we have got to the end of the winter with nothing to carry forward into the following Winter. We have had farmers coming to our door asking if we have feed for sale. Also, we have heard a tale of a farmer driving up and down the A39 – seeing round bales in a field and seeking out their owner to see if he could buy them. It has been that desperate for many with large herds to feed. This situation has also compounded the restriction we are currently under with regard to bovine TB. Every year our stock have a compulsory test and we have been fortunate to ‘go clear’, despite being surrounded by farms that are ‘shut-down’ due to TB outbreak. 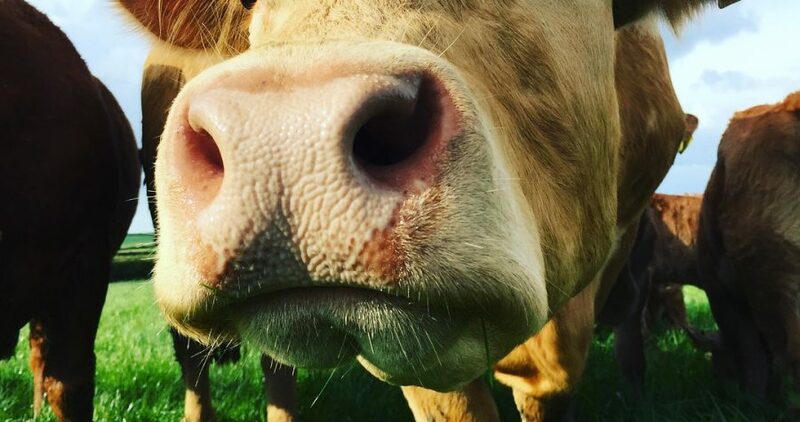 In December 2017 we were asked to have an out of sequence test as there was a case of TB discovered on a farm that borders our own. In this test we had an animal that was ‘inconclusive’. She was tested again 60 days later and again was ‘inconclusive’. Because of this we were placed on restriction which means no stock can move off the Farm and we would not be able to sell our yearlings this Spring as we usually would have done. This gave us 24 more mouths to feed for longer than usual. We have just had another test at which we went clear but the authority will not remove our restriction until we have a second clear test. This test is scheduled for July and we are keeping our fingers crossed that we go clear and can resume normal trading. Incidentally, the post mortem on the cow that was ‘inconclusive’ showed no lesions. Frustrating! 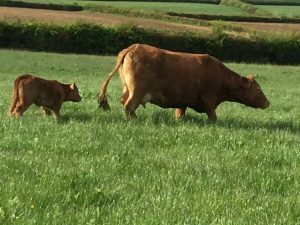 Thankfully we have had a period of beautiful weather; our cows and the calves have been turned out into the fields (they we overjoyed too)! It was the first time the calves had felt grass under their feet. We hope you have found our update interesting, farming doesn’t always go to plan as the weather plays such a vital role. Somehow, however, Mother Nature has a way of making things better. 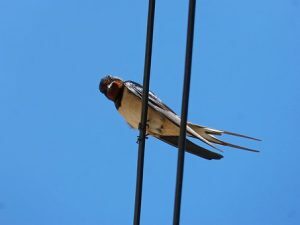 Swallows have arrived early this year!